In Jews, Race and Popular Music, Jon Stratton attempts to stage an intervention at the fulcrum of the peculiar relationship between Jews and popular music. 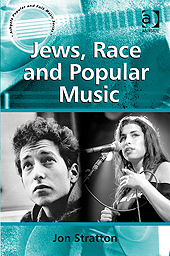 The historical coincidence of Jewish people and African American musical styles—from Al Jolson to Amy Winehouse—has become something of a cottage industry both in and beyond the university (Stratton includes a comprehensive listing of titles in his introduction). In this work, Stratton is trying to reframe this well-documented yet still vexing area of research through the lenses of race and performance. The trouble is that he offers an argument that tries so hard to deconstruct Jewishness that he ends up reifying it.